Fortune cookies make a fun addition to any dinner or festive event. Inside of our giant, dipped vanilla fortune cookie is a personalized message and lots of rainbow joy. 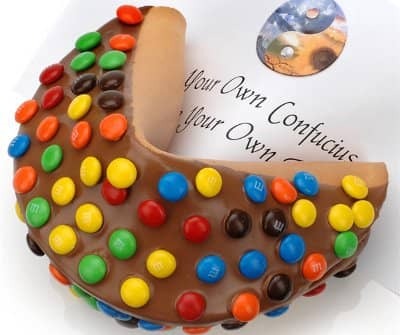 A cookie of many colors - our M&M's® Giant Gourmet Fortune Cookie is a perfect gift and greeting all in one! Our confectionery artisans start with an enormous vanilla fortune cookie baked to order and hand dip it in your choice of Belgian Chocolates or Golden Caramel. Each cookie is finished by hand with delicious multi-colored M&M's® candies studding the cookie for a colorful and artistic presentation.